With Google Assistant and SmartThings functionality to be implemented in the coming months, the Shield TV will gradually become far more than a mere media streamer. It really could be the digital hub of your home, just as Nvidia promised many moons ago. And what price would you put on that? When the original Nvidia Shield TV came out in 2015 it was far and away the most powerful, most capable media streamer out there. Powered by Android TV and being 4K ready, it obliterated the competition with Ultra HD video support and offered a tasty sideline in enhanced gaming to boot. It was pricy though – already more expensive than its peers and the remote control had to be bought as a £50 optional extra. That made it very much a premium purchase and one that was never going to make much of a dent in the sales figures of Roku or Amazon's Fire department. Now a new version of the box is available and Nvidia is confident enough to keep it around the same price: £190. This time, however, you get a game controller with a mic for Google Assistant voice control (pending a software update), plus an improved version of the wireless remote included the box. When you compare the Shield TV's talent to others on the market, the extra spend is justified. Here's why the 2017 Nvidia Shield TV really is the daddy of media streaming. Nvidia Shield TV (2017) review: What's new? Those with the previous model don't need to consider an upgrade to this one. Bar a couple of design features and enhanced accessories, the 2015 Shield TV offers the exact same experience as the 2017 edition. It now has identical software to the 2017 model, thanks to a downloadable update. And all the apps and menu systems are the same, including (pending a forthcoming software update) Google Assistant voice control and SmartThings smart home support. You do need the new Shield game controller for Assistant, as explained below, but that's available to buy separately and works fine with the old Shield too. Both boxes run on Android 7.0 Nougat and have access to 4K HDR (high dynamic range) programming through Amazon Video, as well as Netflix and, ultimately, YouTube. You can also GameStream games in up to 4K HDR from a PC running a capable Nvidia GeForce graphics card. What is HDR (high dynamic range) and which TVs support it? If you're new to the device though, the latest version is the only one available and you're getting a better deal than before. It's smaller than before – considerably so. And while it still looks very "gamey", with its angled exterior panels and glowing green LEDs, at least you can hide it away more easily should you not like that sort of thing. The game controller has also been redesigned. Not only is it now low-latency Bluetooth rather than Wi-Fi Direct, which should improve battery life, it fits far more comfortably in the hand. We're not entirely sure what's going on with the polygonal casing, which isn't as ergonomic as other gamepads out there, but it is lighter and less chunky than the previous version. The controller also doubles as a wide-field microphone. This will be important come the full integration of Google Assistant through a future update, as the game controller will be the device to pick up your voice commands. What is Google Assistant, how does it work and when can you use it? Google Assistant will eventually enable the Shield TV to be controlled almost entirely by voice, and Samsung SmartThings support will add the ability to control smart devices around the house. It will effectively turn your Shield into a Google Home or Amazon Echo, albeit one that plays media through a TV rather than speaker and has the ability to bring up visual, on-screen results too. We've seen it work with a Nest thermostat, coffee maker and lighting in an early demo, so it's an excellent addition when it comes. Nvidia chose to use the game controller as the mic, however, so you do need to leave it lying around within earshot, which might not please all home owners. Nvidia told us that was necessary though. Putting the mic in the Shield TV box meant that it would have to be proudly displayed instead. Many owners want to hide it away in an AV cabinet or TV unit. And using the wireless remote was a no-no because of its size. You might lose it down the side of the sofa or the like, interrupting its voice pick-up capabilities. The game controller is the most likely part of the package to be left on the top of the stand or somewhere to the side. We prefer to keep our game controllers in a drawer, but hey, horses for courses. The wireless remote control does have a microphone, too, which works with the Shield TV's already-implemented voice search. It is contextual and works well, finding content across multiple apps in the one search session. This is more a feature of the Android TV platform and is nothing in comparison with Google Assistant when that arrives. You ain't seen nothing yet. Or heard it. One excellent improvement to the remote is that it has a cell battery rather than rechargeable version. The former remote lasted about two weeks to a month on a charge, which was hugely annoying when all you wanted to do is watch an episode of Stranger Things. The new one lasts a year or so before needing a new, cheaply sourced battery. It also has an IR transmitter this time, which can be set to control your TVs volume as well as switch it on or off. The game controller can too. The back of the Shield TV box is uncomplicated but well stocked. There is an HDMI 2.0 port that supports the HDCP 2.2 copy protection standard – essential for most Ultra HD content. It can also control your other home entertainment tech through HDMI CEC – allowing different devices to talk to each other and do things like switch on together with just one button press. Importantly, it is also HDR capable – something few boxes on the market can do at present and a real game changer for those with compatible televisions. It can also handle Dolby Atmos and DTS-X audio streams, which will become more important as a greater number of soundbars and speaker systems adopt them. There are two USB 3.0 ports on the rear too. These allow for connection of external drives or accessories, such as a keyboard. We advise getting a USB 3.0 hard drive or memory stick if you do fancy expanding the storage – especially from the meagre 16GB of the standard, non-Pro Shield TV. The data transfer rate of USB 3.0 is noticeable and if you store media files on an external USB 3.0 HDD, playback is far quicker. There is a Shield TV Pro version available too, with 500GB of internal solid state drive storage, but at £280 it's considerably more expensive than the standard Shield and an external drive. You can even get a 1TB USB 3.0 drive these days for less than £50. You can also use your Shield TV as a Plex media server these days (both the new and old models) so using a USB 3.0 drive means you'll be able to stream your content around the home efficiently too. The last port on the back of the box, save for the mini-USB power input, is for Gigabit Ethernet. You don't necessarily need to cable the internet connection, with 802.11ac Wi-Fi supported too, but we thoroughly recommend it if you want a stable 4K HDR video flow from Netflix and Amazon Video. 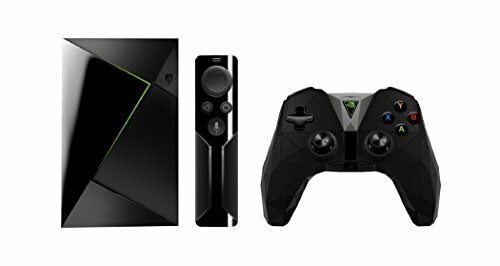 The main purpose of the Nvidia Shield TV is to play video and play it well, whether you are streaming your own films and TV shows stored locally or through services, such as Netflix and Amazon Video. It is the only set-top-box available that plays both Netflix and Amazon Video in 4K HDR. The Amazon Fire TV plays Amazon's own content and Netflix in 4K, but no other external box supports HDR for both too. This might not sound as good to you if you already own a 4K HDR television with both Netflix and Amazon Video as part of its smart functionality, but we've also found that the Shield TV plays them more efficiently. It locks down the highest resolutions faster than our 2016 LG E6 OLED TV, for example, which is no mean feat. The thing missing is Dolby Vision on Netflix – content plays in standard HDR – but that's only relevant to a small handful of people who have the enhanced high dynamic response tech on their TVs. Until spring 2017, LG's OLED sets are the only tellies that support it and, even then, few others are currently planned for release. It's one of those things that would've been a nice-to-have, but largely irrelevant; HDR is more than good enough. While Ultra HD resolutions are noticeably sharper than Full HD, high dynamic response tech is revolutionary and a real game changer. Higher brightness, greater contrast and a wider colour gamut result in distinctly better and more involving images. There are plenty of HDR-ready TV shows available on both Amazon Video and Netflix these days, and they almost always look superb. We're also waiting for YouTube to start streaming HDR content through its apps on a more universal basis. And for Google Play to introduce its 4K movie service for rental or purchase in the UK. But the support of the big two streaming services is welcome and more than enough to be getting on with. The box is Chromecast enabled too, which means it works just like Google's own media streaming dongle. However, from our tests it doesn't replicate the Chromecast Ultra's ability with YouTube HDR content. It'll play YouTube 4K videos fine, when cast from an iPhone, iPad or Android device, but not in HDR. Also disappointing, in a video sense, is that terrestrial TV catch-up is still poorly supported by Android TV and, therefore, the Shield TV box. While BBC iPlayer is available, ITV Hub, Demand 5 (My5) and All 4 are not. You can stream the three services from your mobile device through Chromecast support, but many rival devices support them natively, including the Amazon Fire TV and Roku boxes – a more elegant solution by far. Android TV has support for some other media apps though, including DisneyLife – Disney's own Netflix-style service. Few other boxes can access it at present. And, as we've mentioned, the Plex app on the Shield TV is superb. Not only can it play your locally stored media with great metadata and cover art support, it can make your box a media server for all other devices to stream content from. The Kodi media player app is also available, for those without a Plex subscription. While we feel the Nvidia Shield TV box betters its peers in video quality and support for the highest resolution and picture tech standards, those might not be enough to justify its price alone. Add its games-playing prowess though and you start to realise why you're paying a premium. There's a good reason this box comes bundled with a game controller. Like its predecessor, the Shield TV uses its Nvidia Tegra X1 processing to enhance Android gaming and stream fully-fledged PC games locally or over the internet, with little perceptible lag on the latter. The Android TV platform, updated to Android 7.0 Nougat in this case, offers plenty of games through the Google Play store – hundreds in fact. They have all been optimised to be played on a television, using a gamepad, but are generally the same games you've also played on an Android phone or tablet. Indeed, if you've bought them for your mobile device already, you can also play them on the Shield. Nvidia also makes deals with some Android developers, who have enhanced some titles to make use of the improved graphics tech afforded by the Tegra X1 chipset. Versions of games, such as Portal 2 and Half-Life 2, are available for the Shield TV only, and they play just like their PC equivalents. But for the best gaming experience, you can also subscribe to Nvidia GeForce Now, the company's cloud gaming service, or stream your own PC games over a home network. The former is a service that has been available for a while now, with more than 40 games available to play as part of a monthly £7.49 membership fee. In addition, you can buy recently released games for one-off fees and play them over the cloud too. The benefit to doing so is the games are hosted and played on high-end gaming PCs with the latest Nvidia GeForce GTX 1080 graphics cards so will run in their highest settings. The video is sent over the internet to your Shield TV, while your controls are fed the other way. There is very little lag and it effectively feels like you are playing the game locally. Video is displayed on your TV at up to 1080p in 60 frames per second, depending on your broadband speed, and we've rarely had any image issues. Nvidia's GameStream tech is similar, but you host the games yourself. You need GeForce GTX graphics, preferably one of the newer models, and not all games are supported, but if both boxes are ticked you can play some of your best PC titles in resolutions up to 4K at 60fps. It even supports 4K HDR game streaming, but we're yet to encounter any HDR content in that sense. During a demo using a very high-end gaming PC, running a GTX 1080 card, we managed to play Titanfall 2 in 4K and 60fps. It looked as if the computer was directly plugged into the TV and we didn't notice any controller lag at all. Considering it is a Bluetooth controller and running the game over a home network, that's impressive. You do need to hardwire the internet connections of your Shield TV and PC to get the highest quality, but it still works over Wi-Fi in lower resolutions. Regardless of how you do play your games, be they Android, over GeForce Now or GameStream, they are now all grouped together on the homescreen. Nvidia's previous, lightly customised menu system used to segregate them, but now just has a single section for games – in much the same way as there is an all-encompassing apps section. Games will be tagged if they are housed on PC or in the cloud, after all, you'll need your computer on if you want to play them through GameStream, but we like the fact that there's a one-stop location to find titles. You can deep dive into specific types a bit more in a dedicated Nvidia Games app, which keeps the homescreen clutter free. Other aspects of the menu screens have been simplified too, mainly thanks to Android 7.0, such as settings, although it retains a similar aesthetic to before. The top strip of the homescreen shows suggested and current content across different app. Voice search runs along the very top. The Shield TV is expensive, but its cost is relative. An equivalent Apple TV, for example, is only £50 less. And that's restricted to 1080p. It doesn't have half the bells and whistles of the Shield either. The Nvidia Shield TV is pricey because of the tech. The Tegra X1 chipset is the most powerful you'll find inside a mass-market media streamer to date. And how many set-top-boxes are capable of not only streaming games but in 4K and 60fps? If gaming is important to you then Nvidia has the ideal solution here. There are a few video apps and services notably missing from Android TV in general, which leaves room for improvement. But its Netflix and Amazon Video support is second to none in a set-top-box thanks to 4K HDR support for both. It's also an excellent way to add a Plex media server to your home network – just add a USB 3.0 storage device full of content. And when you consider that Google Assistant and SmartThings support will both be implemented in the coming months, it's clear the Shield TV has the potential to be far more than a mere media streamer. It really could be the digital hub of your home, just as Nvidia promised many moons ago. And what price would you put on that? Amazon's Fire TV 4K box might not have HDR, but it's a great access point to Amazon Video and even Netflix in Ultra HD. There's also gaming and other content for a cut of the price of the Shield. No 4K to be found here, which makes Apple's offering feel a step behind. There are, however, plenty of games, Apple compatibility, catch-up apps and Siri voice control.